"Financial Services – reflections on leadership in a post financial crisis world"
This lecture will provide reflections on values based leadership in the context of the 2008 crisis fall out and broader changes to the Financial Services industry. It will explore how the attributes and values expected of leaders across a myriad of stakeholders are being recalibrated as the industry takes stock of the lessons learned from the crisis. The session will examine how evolving generational values and digital advancement are not only impacting and shaping customer needs and wants, but more broadly are changing societal perceptions of and demands on leaders in the industry. 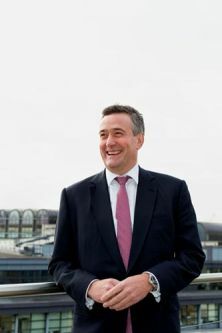 Andrew Bester, Group Director and Chief Executive, Commercial Banking, was appointed on 1 July 2012. He is also Executive Sponsor of Diversity and Inclusion programme and the Group’s Agility Initiative. He has worked in Financial Services for 24 years in a wide variety of client relationship, product specialist, finance and general management roles across 3 continents. Andrew started his banking career with Standard Chartered and rejoined in 2004. He was Global COO of the Consumer Banking Division having also been the Chief Financial Officer. Prior to this he was Co-Head of Wholesale Banking for Greater China and before that undertook the same role for the Africa region. He also served on the Boards of Standard Chartered in China, Korea and Taiwan. Before joining Standard Chartered, Andrew was the Group Finance Director for Xchanging, a leading European outsourcing firm. Prior to this, he worked at Deutsche Bank in Europe. Andrew qualified as a Chartered Accountant with Deloitte & Touche. He is a member of the South African Institute of Chartered Accountants, the Chartered Institute of Management Accountants, is a Chartered Global Management Accountant and also a member of the Association of Corporate Treasurers. Andrew is the Chairman of Lloyds Development Capital (LDC) and sits on the Board of the Global Financial Markets Association (GFMA). He is also an Advisory Board member of The University of Cambridge Programme for Sustainability Leadership (CPSL) and is a member of the Prince of Wales’s UK Corporate Leaders’ Group. A keen sportsman who enjoys skiing, cricket, cycling and golf. Andrew has completed 22 marathons. Andrew is married with two children. Andrew reports to the Group CEO and is a member of the Group Executive Committee.